Guys. I have a little reader now. She recently made a fort in the dining room, taped up a sign that says “Sienna’s Hideaway,” and now retreats in there to read books all on her own. I’m dying of the cuteness factor, but also because I am SO excited for her world to open up soon. Reading is always a luxurious escape for me. While I haven’t had as much time in the past few years to enjoy that escape, it’s still so treasured, and I am beyond excited for this little peanut to jump into it. We got S’s eyes checked before Kindergarten, and alas, she needs reading glasses (she looks super-bummed about it in that pic though, huh?). Our doctor said it’s a good idea for her eyes, so she won’t get headaches or tire too quickly from reading, just as she’s discovering how fun it is. Not wanting to ruin my child’s whole experience with reading, I decided yeah, a big YES to the glasses. We got by for a few months of nighttime reading with small adult-sized readers, but they were too big and would slide off her face, so she didn’t want to wear them. It’s frustrating that they don’t make kid-sized readers you can pick up at any drugstore, so online searching I went. 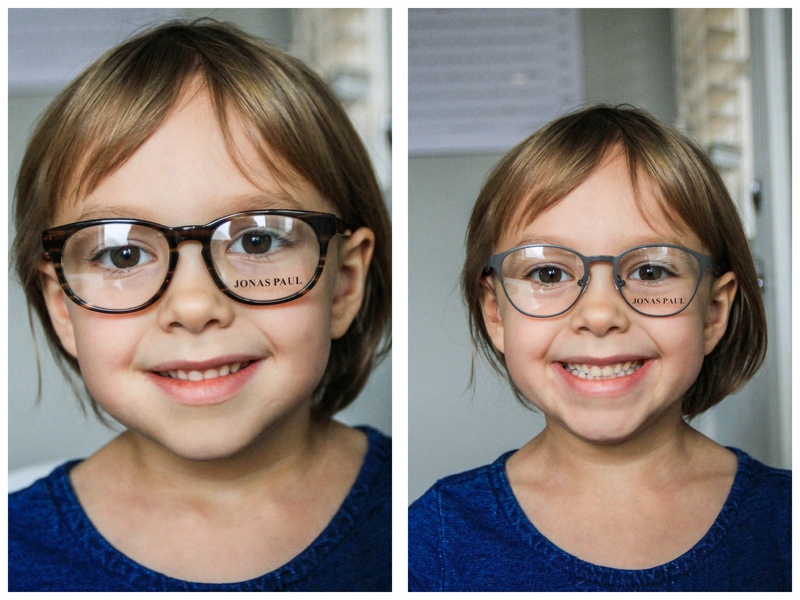 It turns out any kid-sized glasses have to be prescription, so through a recommendation from Elsie at abeautifulmess.com I checked out Jonas Paul. 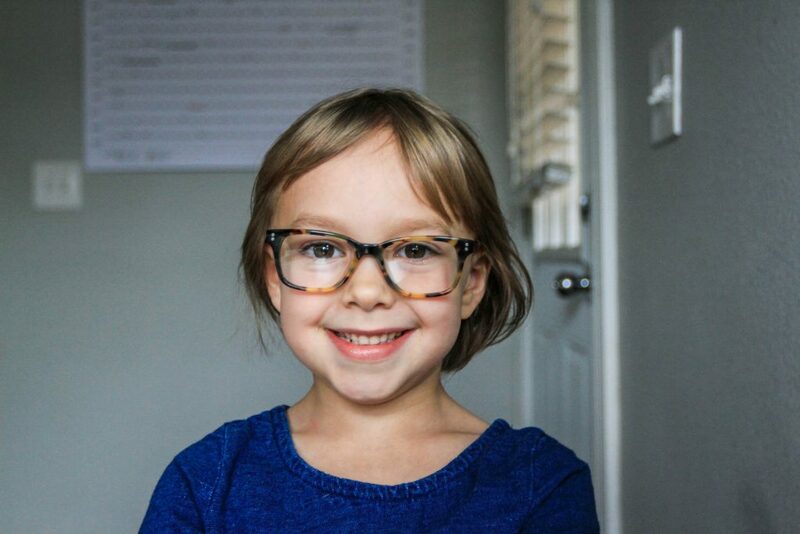 The glasses seem well-designed for kiddos, offering free shatterproof polycarbonate lenses (or choose from a few lens upgrade options), durable spring hinges, hypoallergenic temple arm tips that can be adjusted at home for a good fit around the ear, and extended nose pads to help the frames stay up on little nose bridges. They also offer NerdWax (adorable name) that you can apply to the nose pads for a more secure fit. I adore not having to go anywhere to make fit adjustments. Maybe I can order a pair? #glassesprobs With each glasses purchase, the company also donates Vitamin A supplements to children in low-income regions to help combat blindness. I’m stoked by the current trend of companies that give back. Let’s hope that trend only continues to grow. There were seven styles in the handy, protective try-on box, and Sienna had a blast (at first) trying on each style (until I made her do it like five more times. Ha!) When did my girl get so grown up????!!! Sienna’s favorite was the Elsie (I see you, foreshadowing). I loved the Paige on her, too, but this spicy five-year-old knows what she wants. And OMG. She looks so big. Give this girl a lab coat or something, and she’ll be totally profesh. 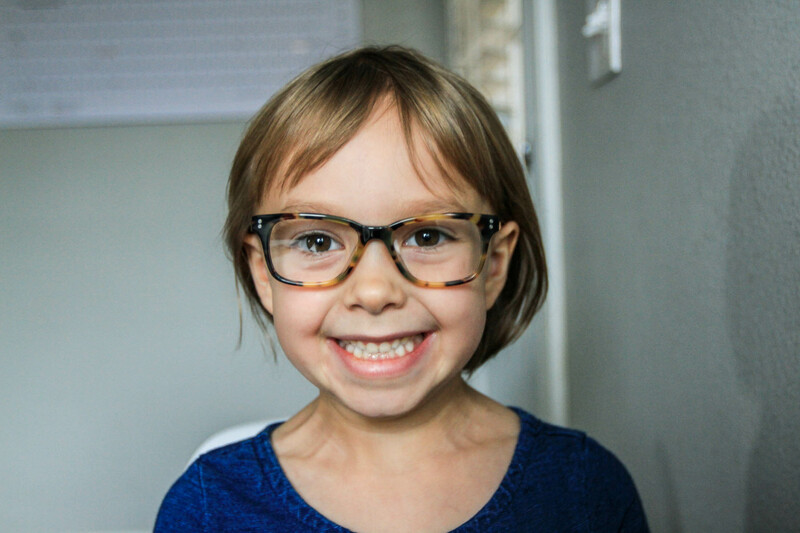 We ordered the Elsie style in tortoise, and emailed in her prescription and PD (pupillary distance) number. The try-on kit comes with a hand tool and instructions on how to measure that. The glasses came super-quickly (less than a week!) and included a nice sturdy case and lens cloth. Sienna is so proud of them — I know I’m biased, but sheesh, I think she looks adorable. Let me know what you think if you’ve tried them out. Here’s to many years of happy reading for everyone. Hop on over to follow me on Instagram @laurajansenstyle to see more of what this mama is up to in Portland, Oregon. 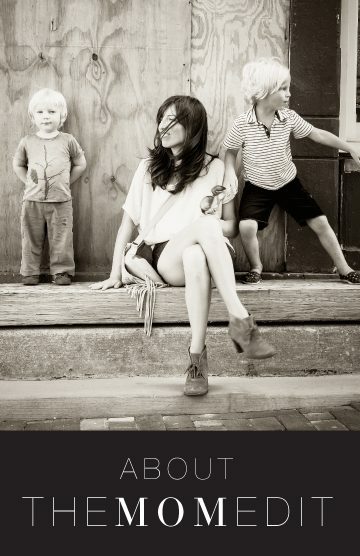 And don’t forget about LikeToKnow.It for easy peasy shopping of the looks I’m loving! She’s so adorable! My kid likes the glasses with the nose pads. They stay on the face better, especially for P.E. when you need to run. Your Doc. can adjust them to fit better. Oh my goodness!!! Sienna is absolutely precious!!! She looks adorable in all of the glasses and seems like she really likes them!! This made me smile!! Oh my god!!! She’s so stinkin’ cute! Love the glasses on her! My daughter, now 7, has been wearing Jonas Paul since she was 3 and we love them!! I wanted her to be stylish and feel proud of her glasses and boy, does Jonas Paul do the trick! She has gotten so many compliment from strangers and friends, and even other kids assuming they were just for fashion. I really do think they made a difference in her overall self-confidence and pride in wearing glasses. 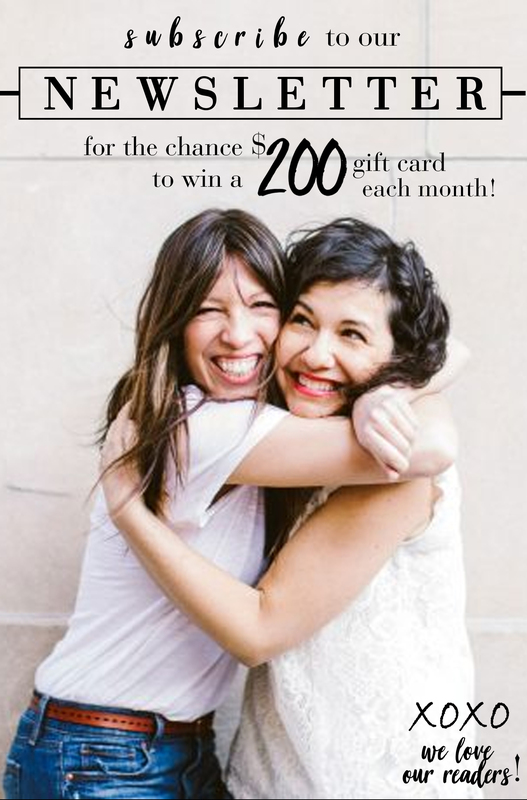 I love this company and am so excited to see them featured here! Oh, yay! I am so glad to hear that. I agree they are the most stylish I’ve found. Thank you so much for your comment and I’m so glad your daughter loves them! For example, kids (or adults!) shouldn’t need Nerd Wax if the measurements for the glasses are correct. You can buy glasses with the right bridge fit and the correct length of the side. If the glasses fit well, they won’t slip down your kid’s face. Hi, I usually love all the TME posts but feel I need to comment on this. In the UK only qualified professionals may prescribe and fit specs on kids under 16, and for good reason. I am more than surprised that an online supplier of spectacles would be so irresponsible as to supply kids 4-7! 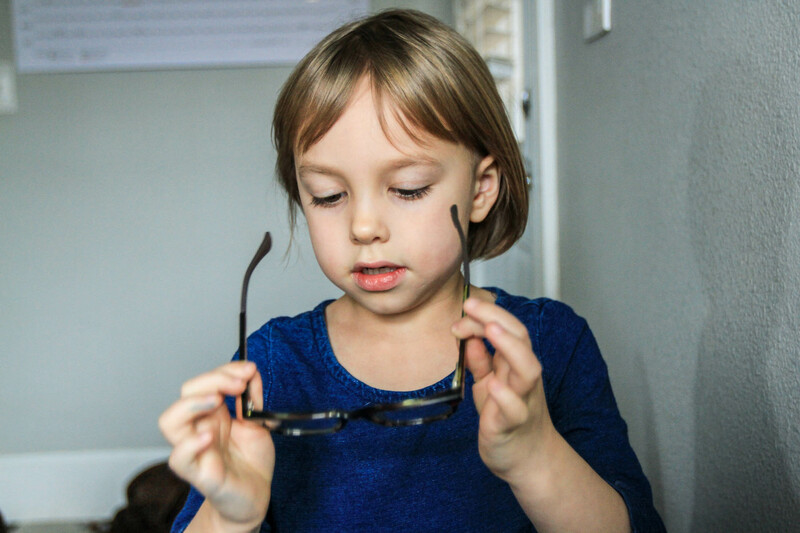 Please, please get kids glasses at a doctor’s office where they can be accurately measured and fitted. Bridge fit, OC heights, PD, length to bend and lens power can all be double checked before collection. Children don’t always notice if things aren’t right and you could cause more harm than good. I hope I don’t cause offence by this reply, but I have a passion for accurate eye care and it is especially important for children. We LOVE Jonas Paul. 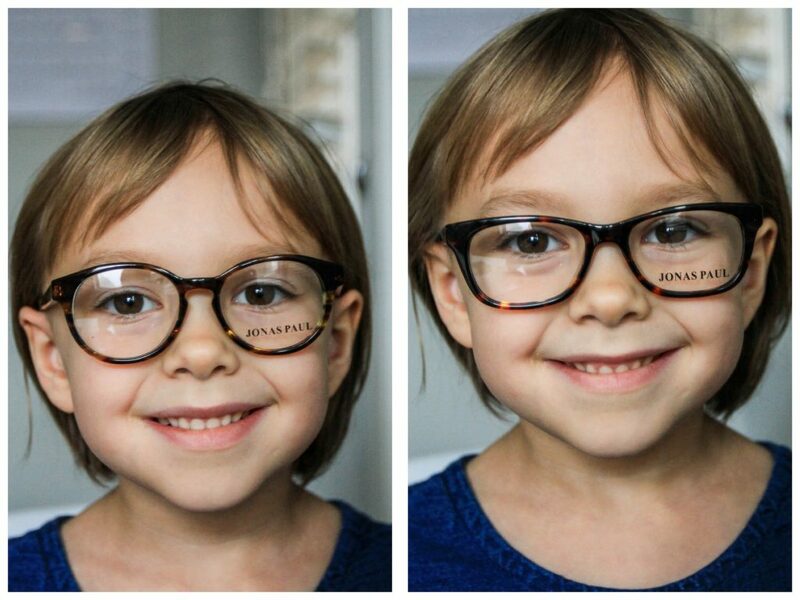 My five-year-old has been in glasses since she was 17 months and until we found this company it was such a struggle. Strap glasses were great when she was really little, but were irritating to her as her head got bigger and her hair got longer, plus, her prescription required lenses thick enough that they’d pop out of flexible frames! 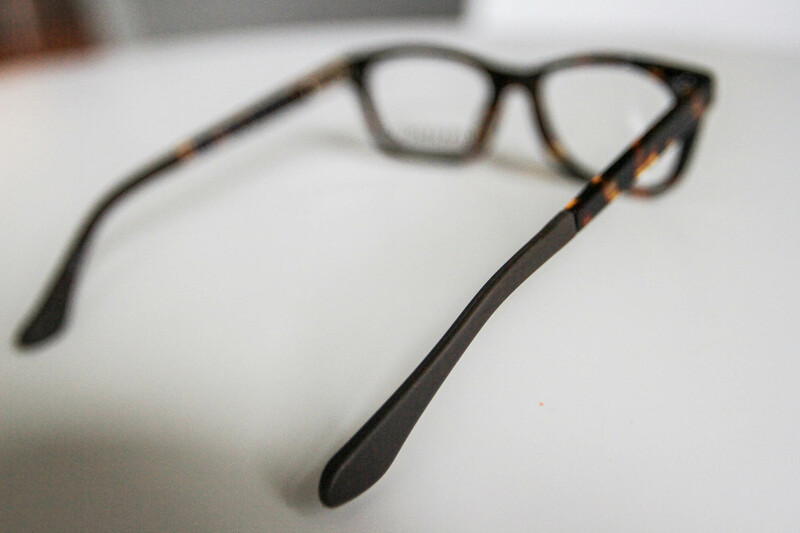 The first year of adult-style glasses was mind-blowingly expensive – we went through something like five pairs, and they all had problems – broke too easily, slid down her face, didn’t accommodate a bifocal well… the glasses store became a nightmare. I tried Jonas Paul when I had given up, figuring that at least we could have the meltdown about frames not fitting at our own house! She’s had the Paige frames in various colors for a year and a half now, loves them, and gets a ton of compliments. And the company’s customer service is fantastic. Another major Jonas Paul fan here! My 8yo has had her current pair for 4 years and we have the try-on kit right now because it’s time to move up to the next size. The glasses are really well made. We’ve had the same frames with no repairs for those 4 years (I probably just jinxed myself!). My daughter’s prescription is a bit complex – we had the local excellent glasses shop check the prescription and Jonas Paul nailed it. My daughter loves them, and I love that they’re stylish, very high quality, and affordable. Can’t recommend enough! Maybe it was not clear in the post, but you can and should send all the measurements that you listed and received from a doctor to Jonas Paul. The try on kit is just to pick style of the frames, the glasses and lenses are made based on prescribed measurements from their eye doctor. 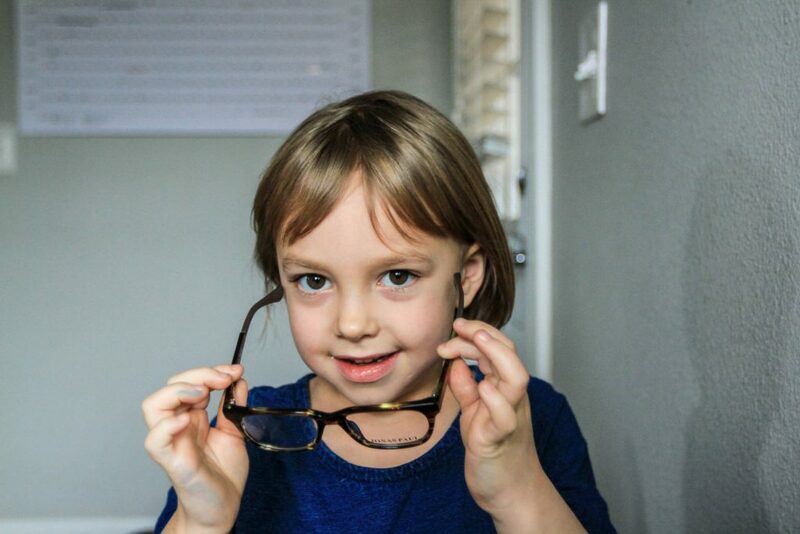 An optician would have helped you find glasses that fit her better. They are too large for the bridge of her nose and they are crooked on her face. 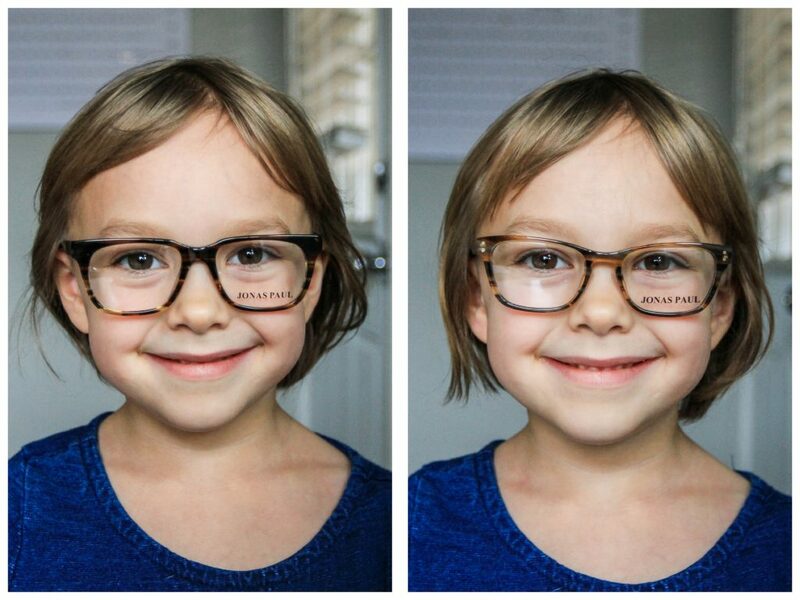 Online glasses aren’t the best option for many folks, especially children. I second that. And I also bring any of our online glasses to our eye Dr. and their optical shop and have them adjusted and fitted to their face. While I recognize they don’t love that I didn’t buy them from then (they should offer better styles!) we are patients in their office and consider it part of their service. It takes all of 5 minutes and then you know they are dr. approved. Yes Julie – we’ve done the same, and have had replacement lenses done locally with our local shop of experienced professionals as well. My daughter has severe astigmatisms and had amblyopia, and the rx and the fit we’re all on point. We’ve since had it checked by her pediatric ophthalmologist as well and they checked out great. 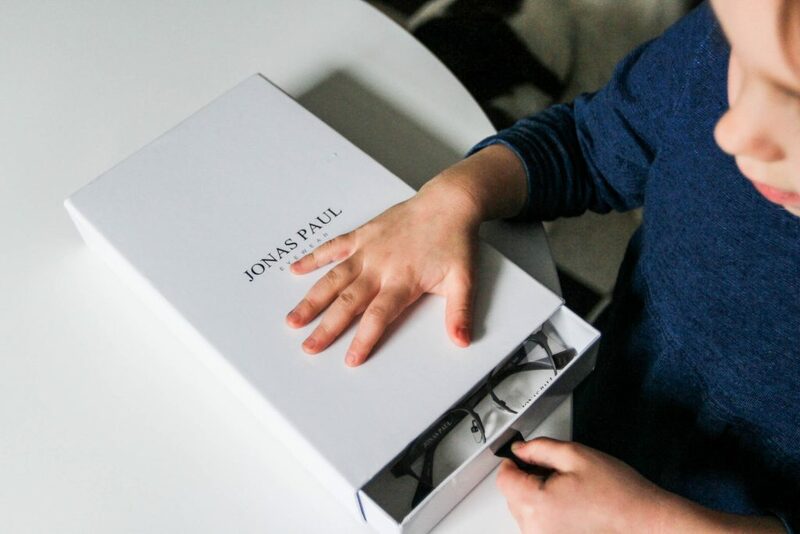 If you read the story behind Jonas Paul you can see they were created based on being passionate about good eye care for kids, starting with their son!